Preheat oven to 350°F. Grease and line four 7” round pans. 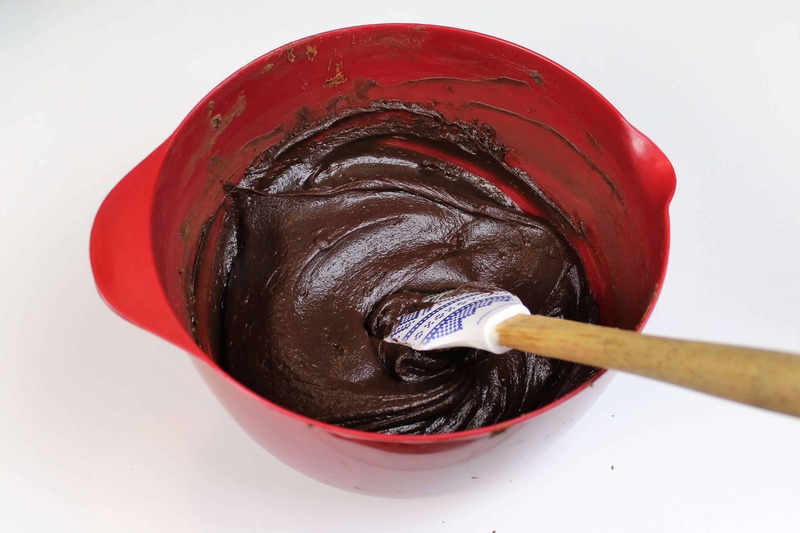 Prepare chocolate cake batter. Divide evenly between the prepared cake pans. Bake for 35 minutes, or until a skewer comes out clean. Allow to cool for 10 minutes, then run an offset spatula around perimeter of the pan to separate the cake from the pan. Place cake layers on a rack to finish cooling. To accelerate the cooling process, I like to pop my cake layers in the freezer once I’ve removed them from the cake pans. Once the layers are fully chilled, remove from freezer and trim off the domes of the cake using a serrated knife. Add a generous amount of simple syrup (1 part sugar, 1 part water, boiled and cooled) evenly across the cakes. I used a sterile, 2.5 inch wide paint brush to ensure even distribution. 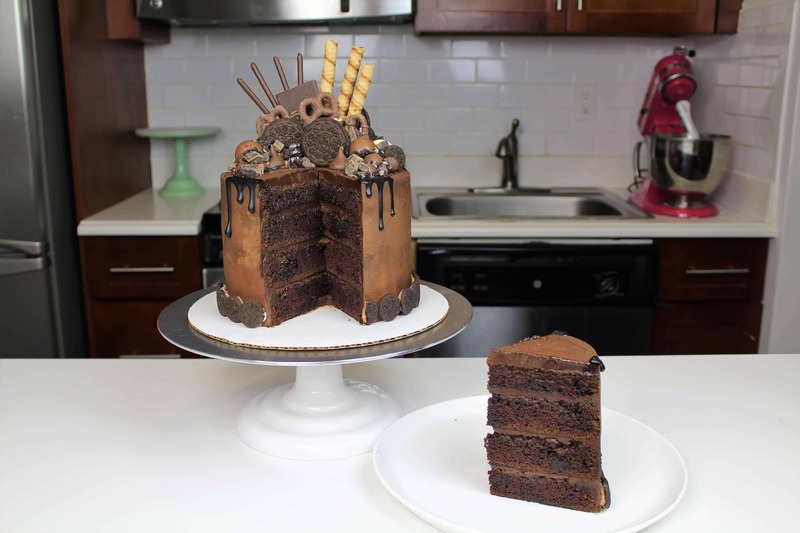 While the layers bake and cool, prepare the two different types of ganache. The process is the same for both. Heat the cream until it just begins to bubble over a medium heat, then pour into two heat proof bowls (3/4 cup into one, 1/2 cup into the other). Gently pour the proper amount of chocolate into each bowl (12 oz. into one, 4 oz. into the other). Let this sit for about 90 seconds, then gently stir until the chocolate is fully melted, and no chocolate bits remain. Allow the ganache filling to cool to room temperature, and pour the chocolate ganache drip recipe into a plastic squirt bottle. Once the cake layers are fully cooled, assemble the cake. 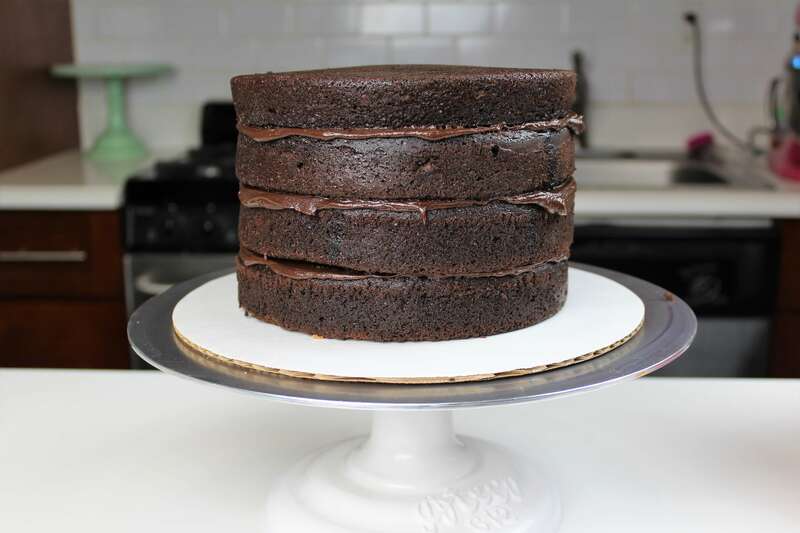 Stack and evenly cover the layers with chocolate ganache. Press down firmly on the top layer with your hand, to make sure there’s no air stuck between the layers. 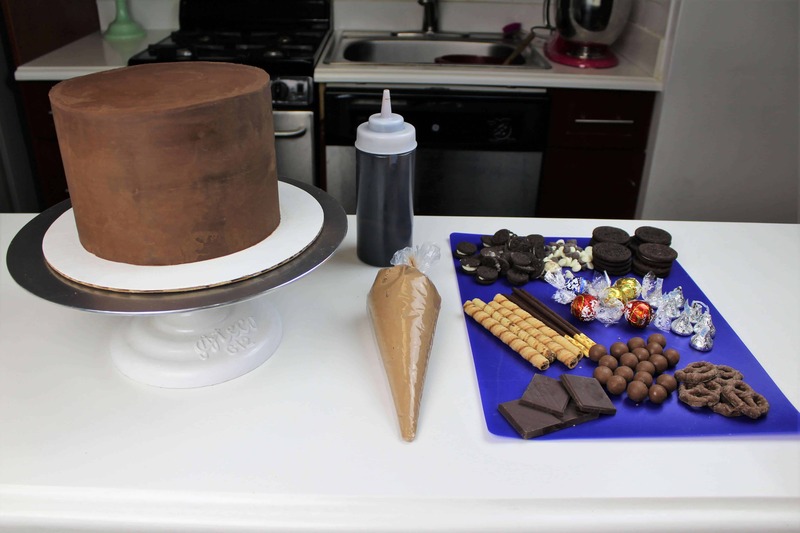 Cover cake with a thick layer of ganache, and smooth with a bench scraper. Place in freezer for 5 minutes to allow the frosting to chill. Add on some chocolate ganache drips, then decorate the top of the cake with anything and everything related to chocolate! I used a bit of frosting I had leftover from a different cake to help secure the toppings onto the cake. I used chocolate bars, oreos, malted milk balls, chocolate pocky, chocolate chips, kisses, truffles, and some chocolate covered pretzels! Can I make the choc ganache filling a couple days in advance? yup! I usually make mine the day before and leave it out overnight! Have you ever used 2 – 8″ pans for your chocolate cake recipe? Trying to figure out what I need to adjust the temperature to. I love the look of this cake! It’s my brother in laws birthday and I want to make this for him! Do you have any tips for transporting a cake like this! Thank you so much for your time. I love baking and I look forward to your weekly live streams! Can I bake the cakes a week or 2 in advance and freeze it? You can make them several days in advance, but I wouldn’t recommend making them more than a week in advance! HI, Just wondering how much ganache you used to cover the cake? The filling part is just for the filling not for covering right? Thanks in advance! It’s actually for both the inside of the cake, and to cover it! I didn’t use a lot between the layers, but if you wanted to you could definitely make more ganache to use on this cake!! Hi! 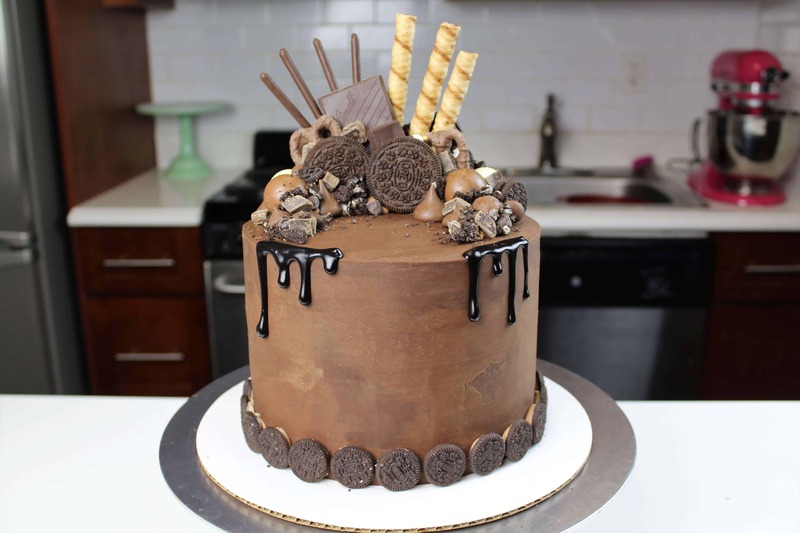 So i am looking to make one of your chocolate cakes for my dad’s birthday coming up. He is a HUGE chocolate fan, and he really doesn’t believe in dessert that doesn’t have chocolate in it. I am deciding between this chocolate cake and the chocolate blackout cake, or if you have another that you think might be good to try. I know they are very different. For him – the chocolatey-er the better. Thanks so much!!!! Hello! I’m making this cake for a Saturday wedding – my plan is to make the ganache on Thursday, bake cakes and assemble/decorate on Friday. Then transport to the venue on Saturday. I was thinking I’d refrigerate the finished cake overnight Friday-Saturday, but I’m afraid when I take it out of the freezer it will get condensation on it (this has happened before with other cakes I’ve done.) Do you recommend I not refrigerate at all? Or just make sure it’s out in a cool room? is the wedding indoors? condensation is hard this time of year! I still think chilling the cake is is the way to go, unless you live somewhere with really high humidity! Sorry, I meant *take it out of the refrigerator on Saturday. Not freezer. Is the correct ratio for ganache filling 3:1 or 2:1?